William Merritt Chase completed The Turkish Page during his student years at the Royal Munich Academy. 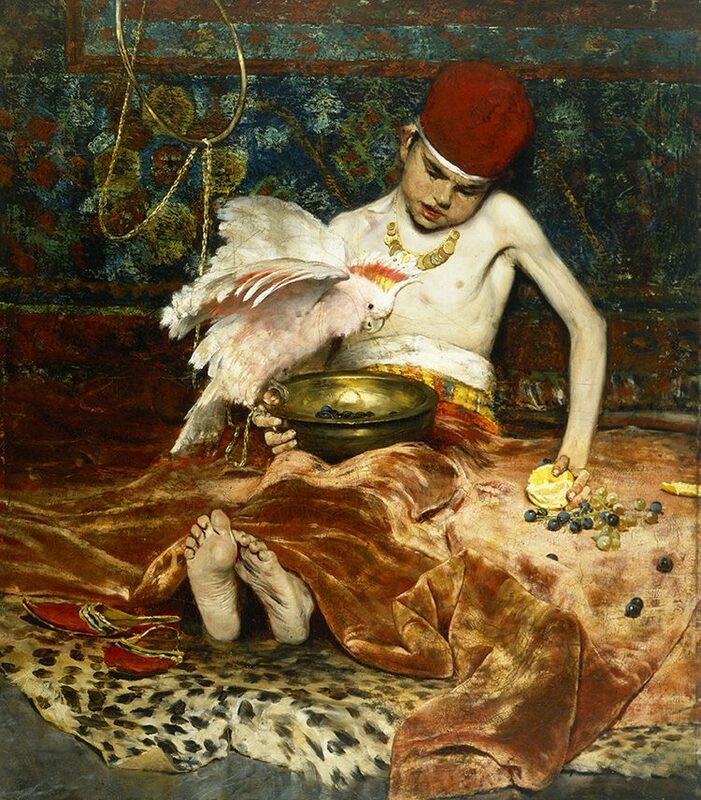 As was common practice with the Academy’s students, he and his classmate Frank Duveneck arranged for a local boy to model for them in Chase’s Munich studio. Bathing the composition in shimmering reflections of artificial light and shadow, Chase captures the boy dressed in exotic Turkish costume feeding a cockatoo from a shiny copper bowl. The artist’s choice of accessories, from the hanging patterned textile, to the plush red velvet blanket and striped leopard rug, reveal his early talent for the illusionistic depiction of shiny surfaces and layered textures, qualities that became the hallmarks of his mature style. Moreover, the painting anticipates Chase’s developing appetite for collecting and adorning his studio with a vast array of objects, as seen in his Tenth Street studio paintings. This entry was posted in Exhibitions and tagged artist models, in the studio, portraits, tenth street studio, texture, the artist's studio, William Merritt Chase. Bookmark the permalink.